The farmers market has been overflowing with fresh local fruits and vegetables lately. There are so many good options that I have to pick and choose what to get and this week I went for the apricots which looked phenomenal. 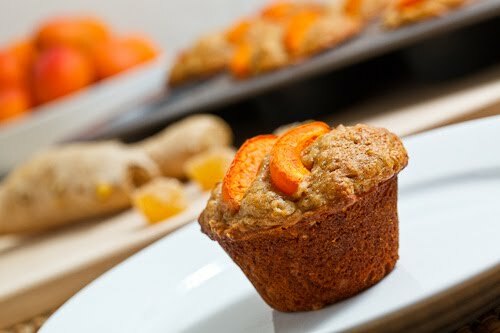 I had recently came across the idea of apricot and ginger muffins that sounded really good and I could not wait to try them out. 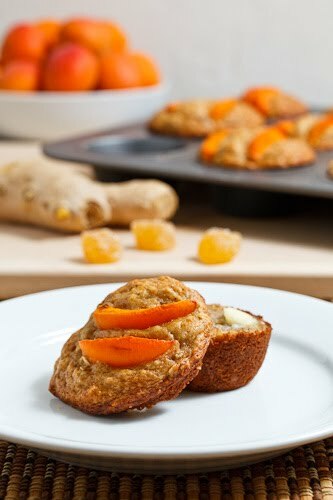 For the recipe, I started out with my favourite muffin recipe and added ginger in the form of both fresh ginger and candied ginger, and topped them off with some sliced apricots. I like this muffin recipe so much because it contains lots to good stuff including rolled oats, whole wheat flour, vanilla yogurt, maple syrup and even an overripe banana. In addition to being fairly healthy this muffin recipe always bakes up nice and light and fluffy and moist and full of flavour. I really like the way the ginger worked in the muffins and the little bits of candied ginger added a great texture. Of course the baked on, slightly caramelized apricot topping stole the show and took these muffins above and beyond. I am certainly looking forward to enjoying these apricot and ginger muffins for breakfast this week! Mix the brown sugar, maple syrup, yogurt, banana, oil, egg, crystalized ginger, fresh ginger and rolled oats in a bowl and let it sit for 10 minutes. Mix the flours, baking powder, baking soda and salt in a bowl. Top each muffin with a half an apricot. Bake in a preheated 350F/180C oven until a toothpick pushed into the center of a muffin comes out clean, for about 25 minutes. Wow, great shot! I love the styling of the ingredients in the background…looks delish!! Looks great, Kevin. I love how you arrange the apricots on top. 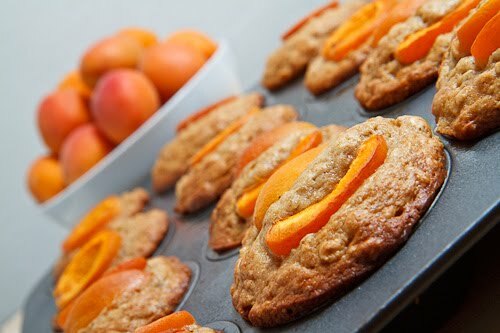 These look very similar to the Ginger Peach Muffins I made yesterday from Kim Boyce's book Good to the Grain! Kevin, these are gorgeous and sound so wonderful! I love the use of maple, yogurt and double gingers in them! and the caramelized apricots on the top? genius! What a gorgeous muffin – you wouldn't even know they are healthy. I just bought some candied ginger a day ago hoping to find a good recipe to put it into. I think I have that recipe now! These look delicious, I can't wait to try them! I was looking for a healthier muffins to bake this week. This would be perfect. Nice picture Kevin. Well done, the apricot and ginger muffins look really delicious. I love that this recipe combines apricots and bananas. Bananas add great flavor. Like the use of apricots as decoration on the top. Stone fruit in bakes makes me jump with joy. These are gorgeous Kevin! These sound like muffins with flavor. I love apricots and all the goodies, inside this muffin. My mouth was watering just reading this! Going to try it. beautiful colours Kevin! looks great! I think baking is really one of the more perfect ways to use up the summer's produce. I love the apricot ginger combo! Those look delicious Kevin – love the idea of a ginger/apricot combo! Those are beautiful!! they look delicious!! I love you blog, I just discovered it. Great blog, I just stumbled upon it. I'm not a big fan of apricots but I love how you placed them on top of the muffins! Nice idea to add the maple syrup, and I'm curious to see how the banana tastes! I love how recipes have a "snowball effect", and evolve every time they reach new hands. Great take on this recipe (and I love the diagonal composition of your last photo!). This is reminding me of some apricot and ginger scones my friend ate recently and raved about. I may look to your muffin recipe for inspiration for ingredients. Kevin, they look just beautiful. That's my kind of breakfast, snack or dessert. I've just discovered your blog. I am really impressed. Your "about me" should be mine as well. I'll prepare these muffins for my blog event about peaches and apricots – thanks. I just finished doing this recipe and I love it. I couldn't find decent apricots so I just topped them with pecan halves which is nice, but I'm itching to try again when I can secure some good apricots. I made these yesterday–delicious! Out of curiousity, what is the benefit of letting the batter sit? Marissa: I'm glad you enjoyed them! You let the batter sit to allow the oats to soften a bit.